There may come a day in the next few years when adult diapers outsell diapers designed for babies. That’s according to Fortune, which says that sales of adult diapers – aimed not so much at seniors as women in their 40s and 50s – are expected to grow by nearly 50 percent by 2020. So instead of marketing adult disposable diapers solely to seniors, advertisers are taking an innovative approach, targeting a younger, hipper audience, with the goal of making these diapers seem normal, even fun. “To tap that market, manufactures have rolled out marketing campaigns to make a leaky bladder seem, if not fashionable, then at least not humiliating,” write Carol Hymowitz and Lauren Coleman of Bloomberg Business Week. These companies use brand ambassadors who are middle-aged, and target women who suffer from bladder leakage that occurs to due to childbirth, obesity or age-related issues. “We’re trying to make the product more normal, and even fun, with real people in our ads saying, ‘Hey, I have bladder leakage, and it’s no big deal,’” Jay Gottleib, head of Kimberly-Clark’s adult and feminine-care business, told Bloomberg last year. All of this is a long way of saying that if you wear adult diapers, you’re not alone. 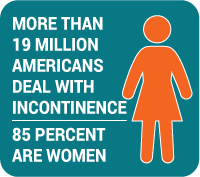 More than 19 million Americans deal with some form of incontinence, and nearly 85 percent of them are women. As many as 1/3 of all adults deal with some sort of bladder issue. Bowel incontinence affects six percent of women under 40, and 15 percent of older women. Among men, that figure is six to 10 percent. According to the International Foundation for Functional Gastrointestinal Disorders, roughly 30 percent of people with irritable bowel syndrome have frequent loose stools, while another 20 percent report bowel incontinence. Singer Katy Perry has said she wore adult diapers in high school to deal with bladder control issues. Comedian Sarah Silverman has been open about her incontinence issues, even writing a memoir called The Bedwetter. Samuel L. Jackson began experiencing incontinence in his 40s, and coped by wearing incontinence underwear. “I realized that this was a problem that millions of Americans dealt with every day,” he said. Author Stephen King keeps incontinence products at his bedside because of a now-healed urinary tract infection. “You never know when you’re going to need these,” he said. In 2015, Oscar winner Kate Winslet gave an interview on The Graham Norton show in which she discussed dealing with incontinence following the birth of her three children. Adult diapers for heavy incontinence protection, featuring a cloth-like inner and other material for comfort and discretion. Protective pull-ons, for people who need incontinence protection but want to wear something that feels like underwear. Underpads are ideal for bed and chair protection, and for patients who can’t use body-worn products due to sensitive skin. Pads and liners for patients with light bladder leakage. Contact us to learn more about our incontinence products. We’re confident you’ll find something that can help you or your loved ones lead a more active, comfortable life.